Be the first to share your favorite memory, photo or story of Mari. This memorial page is dedicated for family, friends and future generations to celebrate the life of their loved one. Mari Hulman George, who touched the lives of millions through her deep passion for auto racing, stewardship of the Racing Capital of the World and decades of compassionate philanthropy, died November 3, 2018 in Indianapolis with her family by her side. She was 83. When her father bought IMS in November 1945, Mari was immersed into the world of auto racing, becoming friends with many drivers during her teenage and early-adult years. That loyalty and passion for the sport and its competitors and teams remained steadfast for the rest of her life. Before her 21st birthday, Mari joined with longtime family friend Roger Wolcott to form the HOW racing team, which fielded American Automobile Association (AAA) and United States Auto Club (USAC) Sprint and National Championship cars for several drivers, including Jerry Hoyt, Eddie Sachs, Tony Bettenhausen, Roger McCluskey and Elmer George, whom she married in April 1957. Mari also was a constant fixture at the track with her family during racing events at IMS, especially in the Month of May. She visited with drivers and team officials in Gasoline Alley and on pit lane and shared in many magic moments. The Speedway also served as a platform for some of Mari’s tireless philanthropic efforts. She hosted the “Save Arnold” Barbecue to benefit Indiana Special Olympics every May for nearly 25 years, from 1981 through the mid-2000s. The fun event united drivers, racing personalities and media with Indiana Special OIympic athletes in sports demonstrations and other activities. The “Save Arnold” Barbecue raised more than $1 million for Indiana Special Olympics. Mari also created a program through which thousands of Indiana school children visited the Speedway each May on complimentary field trips to learn about the connections between education and motorsports. Those field trips continue to this day. IMS prospered and evolved into a new era during Mari’s tenure as chairman of the board, from 1988-2016. During that span, the Indianapolis 500 grew to unprecedented worldwide popularity. The facility also expanded its annual schedule beyond the Month of May to include the Brickyard 400 for the NASCAR Cup Series, the United States Grand Prix for the FIA Formula One World Championship and the Red Bull Indianapolis GP for the FIM MotoGP World Championship. These contributions to IMS and motorsports – along with her charitable work for the racing community – led to Mari being inducted into the IMS Auto Racing Hall of Fame in 2015. Mari’s commitment to racing was equaled by her generosity for supporting local, regional and national causes. She was devoted to the arts and education and served for years as a trustee at the Rose-Hulman Institute for Technology in Terre Haute, which was founded in 1874 with significant assistance from the Hulman family. She received an honorary doctorate degree from Rose-Hulman in 1998 and from Saint Mary-of-the-Woods College, also located in Terre Haute. The Hulman-George family also made large contributions to the Indianapolis Museum of Art, Indiana State University, Purdue University, Indiana University and Saint Mary-of-the-Woods College, among other art and educational institutions. Besides serving as chairman of the board for Hulman & Company, IMS and the IMS Foundation, Mari also was a longtime board member of First Financial Bank, a publicly traded company headquartered in Terre Haute. Mari also was a leading charitable force to benefit animal care, especially for horses and greyhounds, two of her greatest passions. 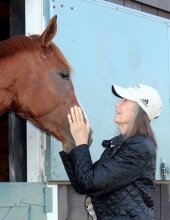 Her dedication to learning and horses led to the endowment and establishment in 1989 of the equine science program at Saint Mary-of-the-Woods, named the Mari Hulman George School of Equine Studies. The school also conducts the Mari Hulman George Thoroughbred Adoption to provide proper care for horses. She also raised, bred and rode horses at the family’s farm, Circle S Ranch near Terre Haute, the family ranch in Wyoming and at stables in Florida. Her quarterhorses and thoroughbreds competed in numerous events. The Mari Hulman George Stakes remain a prestigious annual stakes race at Indiana Downs, in tribute to her dedication to horses and racing. In 2001, the Indiana Department of Homeland Security renamed its search-and-rescue training area at Camp Atterbury the Mari Hulman George Search and Rescue Training Center, recognizing Mari’s contribution to the care of animals displaced and affected by disasters. She worked tirelessly to promote adoption of retired racing greyhounds, leading by example by taking in many of the dogs at her farm. She also housed stray dogs at an extensive kennel at the family’s farm. Mari is survived by three daughters, Nancy George, Josie George and Kathi George-Conforti (Steven); a son, Anton H. “Tony” George (Laura); a stepdaughter, Carolyn Coffey; six grandchildren; seven step-grandchildren; ten great-grandchildren and her longtime companion, Guy Trolinger. She was predeceased by her parents, Anton “Tony” Hulman, Jr. and Mary Fendrich Hulman; husband, Elmer George, a stepson, Joseph George and an infant sister, Mary Josephine Hulman. Mass of Christian Burial will take place at 12:05 PM, Thursday, November 8, 2018 at St. Benedict Catholic Church, 111 South 9th Street, Terre Haute, with Father Martin Day, OFM Conv. and Father Mike Welch officiating. Private burial will be in Calvary Cemetery. Visitation is scheduled for Wednesday, Nov. 7th from 12:00 Noon-8:00 PM with a Scripture Service to take place at 7:30 PM in Callahan & Hughes Funeral Home, 605 South 25th Street, and also on Thursday prior to Mass from 10:00AM – 12:00 Noon in St. Benedict Church. Funeral arrangements have been entrusted to Callahan & Hughes Funeral Home in Terre Haute, Indiana. While Mari loved flowers, it would be her wish for friends to make memorial contributions to any of her charitable interests noted above, the Alzheimers Association, 50 E. 91st St., STE 100, Indianapolis, IN 46209 or to the charity of your choice. To send flowers or a remembrance gift to the family of Mari Hulman George, please visit our Tribute Store. "Email Address" would like to share the life celebration of Mari Hulman George. Click on the "link" to go to share a favorite memory or leave a condolence message for the family.